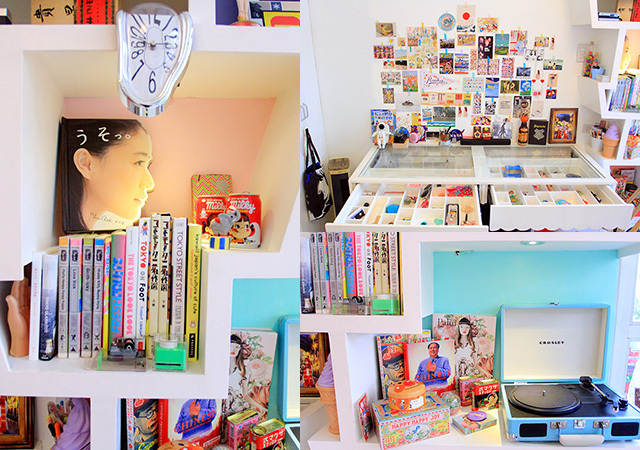 Cube & Condo: You Have To See Reese Lansangan's Artsy Studio! 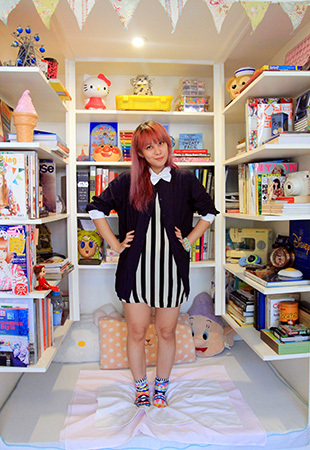 Check out this artist-designer's quirky space! You'll love the studio of up-and-coming artist Reese Lansangan once you see the burst of bright colors and cute cartoon figurines spanning all corners. Like the 25-year-old singer-songwriter, fashion designer, graphic artist, and photographer, the studio is "many things." It's hard to believe that what was once a garage months back is now a library of art books and a mini gallery of vintage toys and trinkets that Reese has gathered from her travels. In a sense, even the studio is an artwork. It's a collage of Reese's fascination for pop culture, science, nostalgia, and Asian kitsch. She just loves soaking up the world and all the beauty it can offer in literature, TV shows, movies, music, and places. It's no wonder her space has a glass desk with her collectibles, a photo wall of colorful graphic designs, and a reading corner. "Surrounding myself with books and resources," Reese begins, "is so important when I'm working that all I really want from a creative space is for it to be well-lit and have books in it. I love being in my studio because everything I need to create and get inspired by is within a box." It seems unsurprising that Reese is an artist today, since art was handed to her by supportive parents who themselves own an art gallery. When Reese was around five years old, she and her mom would dedicate weekends to crafts. Her late father, who played the guitar and the trumpet, introduced music to her through cassette tapes of Disney songs and contemporary bands. He and Reese would always perform at family reunions even if she was painfully shy as a kid. She owes her budding musical career to those times. Last year, Reese earned her second degree in fashion design with a fascinating outerspace-inspired collection. She also had an art and collage exhibit, and released the second all-original EP of her two-man band Reese and Vica. With a strong start in her artistic career, Reese says "Pursuing anything else seems absurd and unthinkable. I know nothing else."